Flexible expansion joints in critical process streams resist attack from chemicals, heat and mechanical abuse. Viton assures a long, maintenance-free service life. Producing titanium dioxide (TiO2) — the brilliant white pigment used in paint, paper and a host of other products — brings new meaning to the word extreme. Extracting the igmentary material from raw titanium ore involves a series of rigorous chemical and mechanical operations that demand top performance from equipment, materials and operating personnel. Hot gaseous chemicals, abrasive slurries and acidic solutions are just a few of the villains in the chlorination process that converts ore to refined product. And, because chlorine and other hazardous and corrosive chemicals are involved, operations must be conducted under the strictest safety requirements with no margin for error. DuPont, the world’s largest producer of quality TiO2, is continually seeking ways to make its manufacturing operations safer and more reliable. 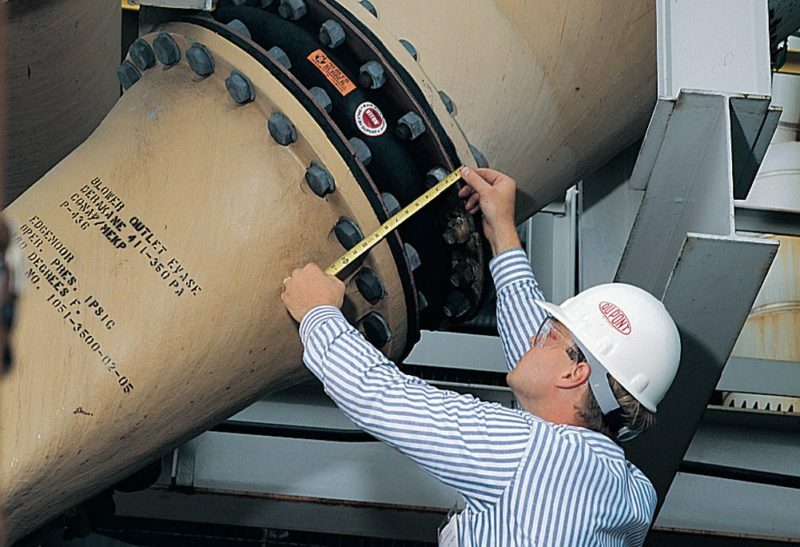 According to the company’s engineering and maintenance personnel, an important contributor to improved reliability has been a family of flexible elastomeric expansion joints used at critical connections in piping and equipment. Manufactured for DuPont by Mercer Rubber Company in Hauppauge, N.Y., these motion-absorbing joints can be made from any of several different elastomers, depending on end-use requirements. Where operating environments are especially severe, DuPont has adopted a premium-quality joint made of heat-and fluid-resistant DuPont Dow Viton® reinforced with high-strength Kevlar® aramid yarn. DuPont’s TiO2 plant in Edgemoor, Del., a long-time user of the basic Mercer expansion joint design, was the first to benefit from the premium-performance version made of Viton. At this open-air manufacturing facility, more than 200 Mercer expansion joints made from Neoprene, Nordel® and other elastomers have been put in service during the past quarter century. According to plant maintenance records, these joints have given outstanding service on process lines and at suction and discharge ports on pumps and blowers in all areas of the manufacturing operation. When a process change at the Edge Moor plant put increased performance demands on much of the plant’s equipment, Mercer set out to develop a joint that would provide superior resistance to chemical, mechanical and thermal abuse. To withstand the more corrosive media and higher temperatures of the changed process, Mercer specified the use of Viton as the elastomer component in the improved design. To further upgrade the new expansion joint, Mercer replaced the polyester reinforcing yarn with Kevlar aramid, DuPont’s super-tough fiber famous for its use in bulletproof vests. A bias-ply angle construction was adopted to optimize the longitudinal and radial strength needed to withstand extremes of movement and pressure. And, a special latex adhesive coating was applied to the yarn to assure integrity of the fiber/elastomer bond. In all, 20 of the new joints made of Viton and Kevlar were installed on pumps and blowers involved in Edge Moor’s process change. Most of the joints were placed in areas where process conditions were especially severe. In every one of these applications, Viton® has provided reliable service with corrosive chemicals at process temperatures as high as 302°F (150°C) and pressures up to 80 psi. What’s more, many of the joints were installed outdoors where they have been exposed to sunlight, ozone and ultraviolet. Yet despite the severity of these applications, all 20 of the original joints made of Viton are still in service. Maintenance records indicate that not a single replacement has been needed in the six years since they were installed. Mercer Rubber Company, a leading manufacturer of engineered rubber products, stocks a full line of piping and ductwork expansion joints made from DuPont Dow elastomers, including certified Viton, Nordel®, Hypalon® and Neoprene, as well as other specialty polymers. Sizes range from 1⁄2” to 144” with pressure ratings up to 350 psi. For special applications, custom units are developed, including rounds, squares, rectangles, offset connectors, tees and special flanges. Selection of elastomer and fabric reinforcing yarn is based on the performance requirements at each application. According to Aanonsen, Mercer’s expansion joints are used widely throughout the chemical; pulp and paper; and mineral processing industries, as well as in power generation systems and water/wastewater treatment facilities. DuPont Dow Elastomers PTE Ltd.
DuPont Dow Elastomers do Brasil S.A. The information set forth herein is furnished free of charge and is based on technical data that DuPont Dow Elastomers believes to be reliable. It is intended for use by persons having technical skill, at their own discretion and risk. The handling precaution information contained herein is given with the understanding that those using it will satisfy themselves that their particular conditions of use present no health or safety hazards. Because conditions of product use and disposal are outside our control, we make no warranties, express or implied, and assume no liability in connection with any use of this information. As with any material, evaluation of any compound under end-use conditions prior to specification is essential. Nothing herein is to be taken as a license to operate or a ecommendation to infringe on any patents. CAUTION: Do not use in medical applications involving permanent implantation in the human body. For other medical applications, discuss with your DuPont Dow Elastomers customer service representative. 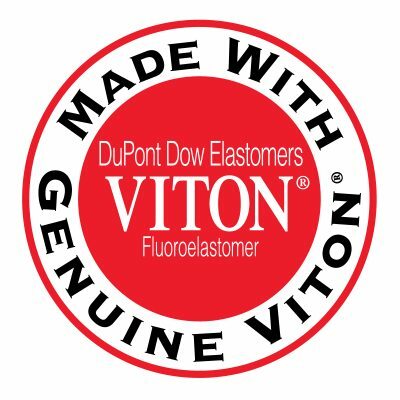 Viton®, Nordel® and Hypalon® are registered trademarks of DuPont Dow Elastomers. Copyright © 1997 DuPont Dow Elastomers. All rights reserved.